Deposit at Bovada Poker and receive a 100% match on your first deposit up to $1000. At Bovada Poker you earn 1 dollar of your bonus for every $3.33 paid in fees. When you earn $5 of your bonus, the cash will be moved from your bonus account to your real money account. Also receive a 100% match re-load bonus monthly at Bovada. Bovada Poker is the re-branding of Bodog for USA players which was established in 2004. Bovada is licensed in Antigua and runs on their network. Support is available through e-mail, LIVE Chat and by telephone. Sign up at Bovada Poker and experience a great gaming experience. They experience good site traffic and offer a variety of tournaments. Pay special attention to the 100K guaranteed on Sunday's as sometimes their is a huge overlay. See below for a complete Bovada Poker Review. The Bovada Poker bonus is a 100% match of your initial deposit up to $1000. Bovada Poker also offers a monthly re-deposit bonus. Clear the Bovada Poker bonus by playing poker and earning poker points. You earn 3 poker points for $1 of tournament fees paid, 1 point for every pot where there is $1 in rake generated, .5 points for every pot with $.50 - $.95 in rake, and .25 points for pots with rake below $.50. You also earn 1 point for every hour spent playing in the Internet poker room. For every 10 points you earn one dollar of your bonus, and after 30 days the bonus earned is deposited into your real money account. Bovada Poker offers every type of major poker game, and also offers some big guaranteed multi-table tournaments. Bovada guarantees over 5 million in pots, one of which being the weekly 100K Guaranteed. Bovada also offers a full service sportsbook and internet casino. Bovada Poker offers depositing methods of credit cards, Money Gram and Western Union. Credit Cards have a good success rate for USA players. Withdraws are sent via Check either through regular mail or express courier. The site traffic at Bovada Poker is fair to good. 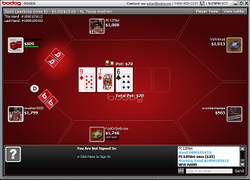 NL Hold'em is the most popular game and traffic for Hold'em ring games and tournaments is very good. Find stakes easily of $50/$100 and tournaments up to a $200 buy in. Bovada is committed to listening to customer feedback, and offers support via telephone, e-mail or live chat. The customer service staff is well trained and resolves any problems as they arise. During our review, we contacted Bovada several times with generic questions and all were answered exceptionally well. Player competition is average at Bovada. At lower stakes the competition is relatively weak and as you progress up the blind levels the competition becomes better. As with other sportsbook poker sites, some traffic is generated from the sportsbook and you will find some gamblers taking risks they probably shouldn't. As a result you can take down some pots.